Have you recently experienced a flight cancellation? An annoying plane delay caused a missed connecting flight or an important meeting? An airline denied you boarding even though you had paid for a ticket? SkyRefund has helped people from around the world claim up to 600 EUR compensation from airlines. Check your flights and claim your compensation today! In cases of flight cancellation, flight delay and denied boarding, air travellers are entitled to receive financial compensation from airlines. However, carriers are often reluctant to pay and usually react in a very elusive manner. Sometimes they hide behind the vague excuse that there were “extraordinary circumstances” which caused the disruption. At other times they just leave you hanging and don’t answer your questions. In each of these cases, we at SkyRefund are here to give you a hand. We can take care of the issue and save you the trouble of dealing with airlines and their apparent disregard for customer rights. We have the legal and practical knowledge as well as the experience to deal with your case while you sit back and relax. Our record in claiming compensation in cases of a flight delay or flight cancellation for passengers stands to prove that we are among the best at what we do. Who are we at SkyRefund? 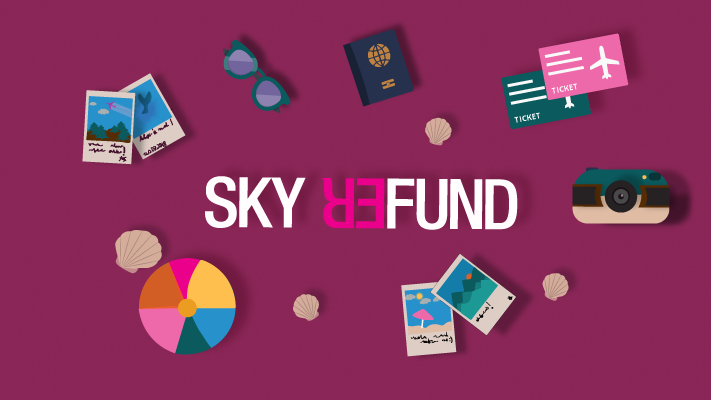 SkyRefund is a freshly founded start-up which helps air passengers obtain their rightfully owed compensation from airlines. To this end, we remain determined to reach out to as many travellers as possible. We are a team of lawyers, legal experts, transport and IT specialists whose knowledge and experience with the aviation industry helps successfully enforce the passenger rights of our clients. Whether you fly for business, tourist or exploration purposes we can offer you our services and make sure you enjoy a pleasant journey. According to a report made by ECC-Net close to 900 million passengers travel by air in the EU yearly. 1/5 of them experienced a flight disruption and were disappointed with the way the airline handled the case. That’s when SkyRefund comes in handy – we do all the hard work for you. It is worth giving our services a try whenever your flight is connected with Europe. Whether you fly in, from or to Europe, you can let us know if you had problems with your flight. Even if you travelled outside Europe, don’t be discouraged to try us out. The rules for compensation apply fully to all airlines that are registered in the European Union. This means that whether you fly with Lufthansa or KLM or are a client of a low-budget company such as Ryanair, EasyJet or WizzAir, we can help you claim compensation. Find out more about your right to flight delay compensation. The best and easiest way for you to contact us would be via our website. You can use our compensation calculator to check whether you are entitled to remuneration. We will then take care of the claim while you sit back and enjoy. Our social media team is happy to answer your questions via Facebook and Twitter. We hope you get in touch with us at SkyRefund soon. We will be happy to help you claim compensation for any flight as far as three years back. Give us a chance and we will help you take what’s yours!